The Smithsonian Institution is poised to open its newest permanent exhibition, the Korea Gallery, at the National Museum of Natural History. 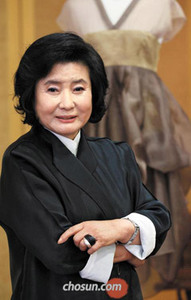 The sixteen traditional Korean costume designs or hanbok on display are made by veteran designer Lee Young-hee. "Dr. Paul Michael Taylor, the director of the Asian Cultural History Program and exhibition co-curator, asked me to donate traditional Korean costumes," Lee says. "I made 12 outfits at first and he asked me to make more -- this time formal ones. So, I presented four more including gwanboks (traditional outfits for high-ranking officers and ministers) and wonsams (formal dresses for women), making it 16 altogether." One of the gwanboks, featured in photo 1 below, was embroidered on the front and the back; the cranes on the front, in particular, denote the official rank of the owner. 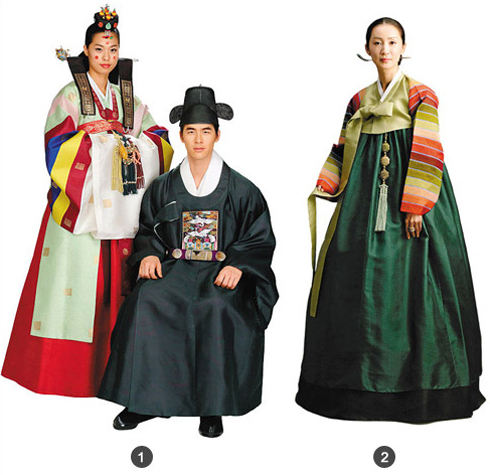 In the Chosun Dynasty, ordinary people could also wear a gwanbok at their weddings. In the case of wonsams for brides, Lee says they were made with woven silk, plus a small bejeweled toque called jokduri on their head and a brooch decorated with gold and silver on the chest. The jeogori or traditional coat for women with stripes of various colors, one of the most familiar images of traditional Korean culture, is also to be on display (photo 2). Lee made it by sewing the colorful fabrics together one by one. "Silk dyed in the traditional natural manner will show Korea's unique beauty. I also stressed diversity and creativity in hanbok by using various materials including woolen yarn, raw silk and brocade." The museum promised her to display the hanbok for 100 years. "They didn't promise it right away. I was in touch with them by e-mail and phone for a year," she says. "Last fall, I got an official confirmation to display them for the next 100 years. Actually, Dr. Taylor is one of the people who love hanbok very much. He says there is no other costume with such fantastic colors and texture of materials." 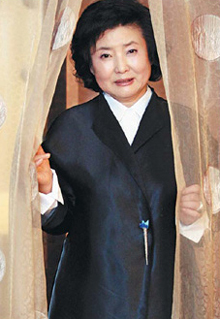 Lee was the first Korean designer who took part in the Paris Pret-a-Porter show and introduced hanbok to Westerners in 1993. Her store in New York is also a great success, and celebrity customers include Michael Jackson, Hillary Rodham Clinton and even fashion designer Miuccia Prada. Lee will present a fashion show at the Hyatt Regency in Washington D.C. on Saturday to celebrate the opening of the Korea Gallery at the Smithsonian. On the occasion, she is also planning to present a traditional shaman ritual for cleansing the souls of the Virginia Tech massacre victims. "I want to pray for the repose of the deceased and extend my condolences to the families in a Korean way to offer words of comfort." Although over 70, Lee is still full of energy. After the fashion show in Washington, she will open the regular collection in New York on Tuesday.